Scottish pension funds should be used as a force for good as well as delivering high quality pensions for our members. I was giving evidence to the Scottish Parliament Local Government Committee this morning on the use of pension funds for infrastructure investment. The Scottish Local Government Pension Scheme has some £26bn to invest. Half of this is invested in overseas equities, investment that comes with significant and often hidden management costs that are poorly understood. In 2013 I wrote a report With assistance from the SFHA on the use of pension funds to build houses and there has been some take up of the idea in Scotland and the rest of the UK. I argued today that the same principle could apply to other forms of infrastructure investment including transport and energy generation. The best investments are those that have a low risk revenue stream. I was asked what are the barriers to greater infrastructure investment? The first is a small 'c' conservatism in pension funds generally. Managers prefer to invest in what they understand and don't like change. This is closely linked to a lack of expertise. They understand equities and commercial property, they don't have much experience in housing or infrastructure generally. If there is a will, there is a simple solution - recruit the in-house expertise. "the precise choice of investment may be influenced by wider social, ethical or environmental considerations, so long as that does not risk material financial detriment to the fund." It is perfectly possible to invest in infrastructure and ethical investment within this framework and pension funds across the UK are doing this better than many Scottish local government funds. The risks involved in some of these unethical investments are not sufficiently well understood. Funds are also weak on shareholder engagement and they could use that leverage to promote trade union, government and council policies more effectively. Another barrier is the investment regulations. I argued today that they are over prescriptive, specifying limits to specific forms of investment. A better approach might be to have a broad duty and a code of practice. That leaves how our funds are structured. We have eleven funds in Scotland and that leads to duplication of cost and little sharing of expertise. Bigger funds are generally more effective in securing better returns on investment and would enable funds to develop greater in-house expertise. It doesn't necessarily have to mean merger, but we can and should collaborate much more. This month sees the start of new governance arrangements for the Scottish LGPS. The new Scheme Advisory Board meets for the first time tomorrow and these issues are in the draft work plan. We also have representatives appointed to the new Pension Boards in each of the eleven funds. It will take time, but this should lead to much greater transparency and challenge to vested interests. Pension funds are a hugely important and under used resourced in Scotland. The new governance arrangements are an opportunity to move in a new direction. But we will need to work hard to break down entrenched positions. Today's parliamentary scrutiny is helpful in moving this along. 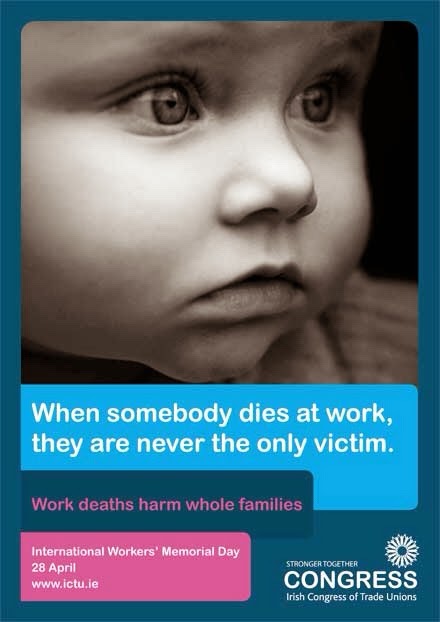 "Remember the dead, but fight for the living" is the rallying cry for International Workers’ Memorial Day (IWMD) today. It commemorates those workers across the world who died as a consequence of their work. There are events planned in Scotland and across the world today. Over 20,000 people die every year because of their work; most of these because of exposure to dangerous substances. So this year the theme is, ‘removing exposure to hazardous substances in the workplace’. Hazardous substances are found in almost every workplace in the UK and many workers have no protection against the possible effects, despite the fact that tens of thousands of workers have their health destroyed by asthma, dermatitis, lung disorders and cancers due to exposures. Most employers understand the importance of safety. However, it is bad employers who have been encouraged by the UK government’s approach. It was David Cameron who made it his new year's resolution in 2012 to "kill off the health and safety culture for good". Safety regulations were "pointless time-wasting" and "an albatross around the neck of British businesses"
This attitude explains why this UK government has slashed funding for the Health and Safety Executive (HSE) by over 40% and banned unannounced inspections from entire industries. That has been compounded in Scotland by big cuts to local authority budgets that have seen safety inspections by environmental health officers reduced. All clothing companies that source from Bangladesh should make an adequate contribution to the Rana Plaza Fund, administered by the ILO. It is shameful that two years after the Rana Plaza factory collapsed, some companies still have not donated adequately to the compensation fund. Workers and their families urgently need this money to pay medical fees and rebuild their lives after this horrific event. Companies have a moral obligation to put the livelihoods of those who make their clothes in Bangladesh first. Work-related illness and stress can be caused by toxic hazards or workplace accidents, but also by ever-increasing hours and impossible workloads. Mental health in the workplace is a growing concern, highlighted today by the See Me survey that shows nearly half of Scottish workers say people don’t tell their employers about mental health problems for fear of losing their job. Even more thought it would impact on promotion opportunities. So, today we will remember those who have lost their lives at work and the families who had every reason to expect their loved ones to come home from work safely. But we must also end the undermining of our carefully developed safety culture and stop expecting workers to be at the beck and call of their employers 24-7 - stretching the physical and mental health of too many workers to breaking point. Public service reform should be built from the bottom up through local democracy rather than centralisation. However, no reforms will be effective unless they are fully funded. I have written a number of articles recently on the broad issue of public service reform. In this blog post I will attempt to knit them together to illustrate a theme around local democracy and fair funding. In the journal 'Scottish Policy Now' I set out an overview of progress with the Christie Commission recommendations on the future delivery of public service. While there has been progress, I argue that on local design, preventative spending and workforce strategy; Scotland is missing out on real opportunities. In a column in The Scotsman, I focused on a specific Christie recommendation - the importance of engaging staff and service users in the design of public services. Four years on, we still have centralisation, ring-fencing and top down targets. I also point to the systems thinking author John Seddon's latest book that clearly sets out the evidence for a different approach. If managers and politicians actually followed through a citizen's request through their systems they would be horrified. Some of these issues are also highlighted in UNISON Scotland's latest survey of staff working in transactional services. Local government has borne the brunt of austerity in Scotland an issue I explored in an article in the Morning Star this week. Four out of five jobs lost have been in councils and ConDem austerity has been exacerbated by the regressive Council Tax freeze. While finance is vital, my main theme was that councils must act as strong local voices. All too often they are the passive administrators of cuts. Finally, we return to funding public services. I contributed a chapter to the latest Red Paper publication on the implications of Devo-Max for Scotland's public services. I understand the case for independence, I might even have voted for it myself, but Devo-Max or Full Fiscal Accountability would be a disaster for public services in Scotland. I explain what Devo-Max is and the main criticisms of it. Put simply, devolved administrations want relatively stable income and expenditure. UNISON and other unions said this long before the oil price crash sharply illustrated the point. Since I wrote this chapter, the IFS has updated their calculations based on the SNP manifesto proposals and they would deliver huge cuts in public services and jobs. Barnett may not be perfect, but abandoning it is a huge gamble. Having said that, this doesn't mean we should accept the limitations of the Smith Commission proposals. In the same Red Paper chapter I set out how we could improve public services with further devolution. Progressive federalism is right for Scotland and the rest of the UK. Labour should also be bolder on ending austerity. 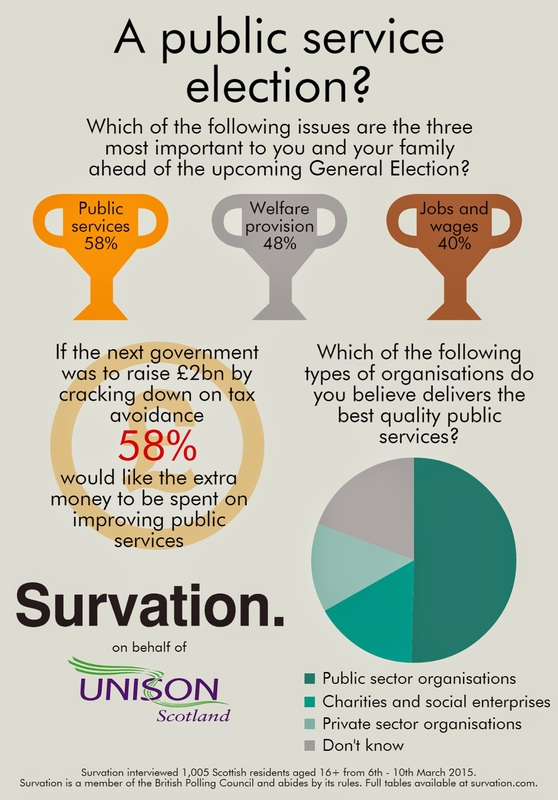 The general election is obviously vital for public services, primarily to end Tory austerity. However, wider consideration of public service reform will not go away and most of those difficult decisions are made in Scotland. This election matters for workers rights. The ConDems have organised a race to the bottom and if the Tories win this election we can expect at lot worse. In contrast, Ed Miliband left the STUC today in no doubt that Labour has a positive alternative. While headline unemployment figures have fallen, underemployment and insecure work has increased. The growth of part-time work, zero or nominal hours contracts, self-employed workers and agency jobs expose the reality of working life. Precarious work damages families and hurts the economy. Zero-hours contracts have come to represent the Tories approach to work. There are at least 60,000 workers on zero-hours contracts in Scotland, although the actual numbers are likely to exceed 100,000. To that we have to add many more on nominal hour contracts. Far from Ian Duncan-Smith's 'flexible working', zero-hours contract workers don't know from one week to the next how much money they will earn. This makes it next to impossible to plan caring responsibilities, find other work, pay bills, register for in-work benefits and get a mortgage or even a bank account. Over 40% of new jobs created since 2010 have been self-employed. This doesn't indicate an upsurge in entrepreneurial spirit, but rather the use of bogus self-employment. Workers are classified as self-employed so they can be sacked without warning, do not receive holiday or sick pay, have reduced benefit entitlements and may be denied access to employment tribunals. Average income of self- employed people has fallen by 22% since the financial crisis. Hard-won employment rights have also been attacked. The cut to consultation periods for collective redundancy mean that it is now even easier to sack staff. Huge cutbacks to the number of workplace visits by health inspectors and deregulation is making workplaces more dangerous. The qualifying period for unfair dismissal has increased to 2 years, depriving millions of workers of any legal protection in the workplace. Tribunal fees have cut the number of applications to employment tribunals for those who do qualify by 77%. Trade unions and collective rights are under threat like never before. Strong trade unions are vital in the fight to tackle low pay and job insecurity and collective bargaining must be strengthened. Anti-trade union laws have restricted the ability of unions to represent their members. From the victimisation of trade unionists by employers to government attempts to restrict facility time and check-off for union representatives. Not to mention the absurd and largely ignored, waiving of employment rights in exchange for shares. Blacklisted construction workers have received no compensation while the companies involved have been awarded lucrative Scottish Government contracts. On Blacklisting, zero-hours contracts a much else, it has been the Labour led Westminster, Scottish Affairs Committee, chaired by Ian Davidson MP, that has done much to expose these scandals. If the Tories are returned to government we can expect an ever increasing number of zero-hour contracts. All-out attacks on trade union rights with continued cutting of facility time, introduction of strike thresholds and removal of collective bargaining agreements. In addition to falling wages for the worse off while the wealthy continue to receive tax cuts and soaring bonuses. While Labour's work manifesto is certainly not everything we would wish, it does demonstrate a vital change of direction. Labour will abolish employment tribunal fees, tackle blacklisting in the construction industry and look at ways to ensure proper facility time for union representatives. Labour will maintain check-off arrangements in government departments where it has already been scrapped and defend unions’ rights to organise. They will ensure fairness in levels of health and safety protection at work and deliver proper recompense for people who have contracted asbestos-related diseases as a result of their work. Labour will end exploitative zero hours contracts and abolish the loophole that allows firms to pay agency workers less than permanent staff. There will also be new flexible working rights for parents. Labour will reinstate third party harassment in the Equality Act to ensure that people are protected from all harassment and bullying at work, as well as requiring large companies to publish their gender pay gap and strengthen the law against maternity discrimination. Today, at the STUC Ed Miliband delivered a passionate speech on these issues. It was warmly received by delegates who want to hear much more of this from Labour. Scotland succeeds when working people succeed was the message and a fairer workplace is the key to achieving that. Water privatisation is in retreat. Water and wastewater is returning to local authority ownership across the world. The Public Services International Research Unit (PSIRU), Multinational Observatory, Municipal Services Project (MSP) and European Federation of Public Service Unions (EPSU) have released new research on the growing wave of cities worldwide that are taking previously privatised water supply and sanitation services back under public control, in a process called remunicipalisation. Over the last 15 years, 235 cases of water remunicipalisation have been recorded in 37 countries, impacting on more than 100 million people. Moreover the pace of remunicipalisation is accelerating dramatically, doubling in the 2010-2015 period compared with 2000-2010. After huge problems in the developing world, private companies have been shifting their efforts to the developed world. It is therefore interesting that recent remunicipalisation is concentrated in high-income countries, with 184 cases compared to 51 in low- and middle-income countries. The great majority have taken place in two countries: France (94), home of two of the world’s private water companies, Suez and Veolia, and the United States (58). Transnational Institute water expert Satoko Kishimoto said: "This report shows that water privatisation, which has been promoted so heavily in recent years, is increasingly being rejected by cities worldwide after years of failed promises, poor services and high prices. The pendulum is swinging back in favour of public water, because of the strong evidence that remunicipalisation brings immediate cost savings, operational effectiveness, increased investment, higher levels of transparency and accountability." The former Deputy Mayor of Paris Anne Le Strat, who was behind the flagship 2010 remunicipalisation of water in the French capital added; "Moreover, public water operators are now joining forces within and across countries to support and learn from each other so we can achieve the human right to water for all." The book Our public water future: The global experience with remunicipalisation comes out as global leaders are gathering for the World Water Forum, which is dominated by private water operators and has been a key proponent of water privatisation in recent years. The delivery of clean water and sanitation also has to be seen the context of a global water crisis with supplies running dry at an alarming rate. The world’s population continues to soar but that rise in numbers has not been matched by an accompanying increase in supplies of fresh water. The consequences are proving to be profound. Across the globe, reports reveal huge areas in crisis today as reservoirs and aquifers dry up. More than a billion individuals, one in seven people on the planet, now lack access to safe drinking water. We should therefore be doubly grateful that we live in a wet country with a public water service. And we want to keep it that way. Well, the public service bit at least! Scots want slaughter houses to be independently inspected by government meat safety inspectors, not handed over to the industry to regulate themselves. UNISON has commissioned independent pollsters Ispos MORI to find out what people living in Scotland think about how we ensure the food we eat is safe. This follows a number of food scandals and the news that 73% of chickens in the UK tested positive for the presence of the campylobacter, the most common source of food poisoning. The report shows that almost all Scots (98%) believe that official slaughter houses should be inspected to ensure they are meeting food safety and quality standards; the vast majority of Scots (95%) believe that slaughterhouses should continue to operate to official standards; three quarters of Scots also believe slaughterhouses should be inspected independently (75%), and majority of Scots (70%) also agree that standards are more likely to be met if they are carried out by government inspectors. So that is very clear. Unsurprisingly, the overwhelming view is that independent inspection is a very good thing. Sadly, governments and the meat industry are running with a different agenda. There is continued pressure from Europe to de-regulate meat inspection with the active support of the UK Government and the Food Standards Agency. The Scottish Government went along with cutting safety standards recently when they approved the visual only inspection of pigs. This means tumours and abscesses will be minced into the sausages and pies we eat. The meat industry lobby has clearly been busy in Scotland as well! Tim Lang, professor of food policy at City University, said the FSA had been ‘captured’ by industry interests. "This is a sad day for British food policy. A quarter of a century after the British learned of the extent of contamination of poultry, we are back again with unacceptable levels of food-borne pathogens. Then, it was salmonella. Now, it’s campylobacter." This month meat inspectors have been transferred into a new Scottish Government Agency, Food Standards Scotland. During the horsemeat scandal Scottish Ministers were able to blame 'Westminster', even though the regulations on food safety are devolved. Now the physical inspection is managed by a devolved institution as well. So, this report is a timely reminder to the Scottish Government that food safety is a priority for Scots. Scots believe the meat trade should be independently inspected and regulated, and they think that meat inspection should be carried out by government inspectors. This is too important to get wrong. We have been concerned about the lighter touch regulation which has been promoted across UK and EU meat trades. The Scottish Government’s new agency Food Standards Scotland must ensure we maintain a strong, well regulated, independent meat inspection regime. This election matters because Scotland and the UK needs a government that understands the importance of wages to individuals and the economy. Since Cameron became Prime Minister the average wage is worth £1600 less or nearly £2,000 if you are a public sector worker suffering under UK and Scottish Government pay policies. This is the worst fall in living standards since Queen Victoria was on the throne. 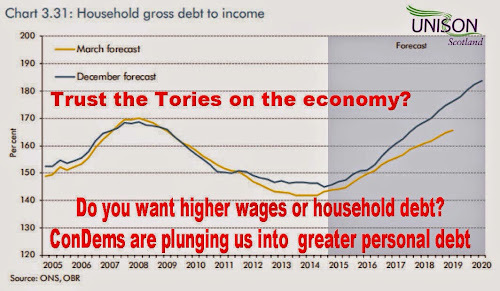 This has happened because the economy has seen a big shift from wages to profits. If the wage bill had just kept up with inflation there would be £5bn more spending power in the Scottish economy. 52% of working age adults in poverty are living in households where at least one adult is in employment, as were 59% of children in poverty. The very 'strivers' the Tories claim to represent. Even among those suffering, the pain is not evenly spread. Women in low pay have a pay gap of 34.2% and young workers classed as low paid has more than tripled over the past four decades. In contrast, the wealth of the richest 1,000 people in Britain doubled to £519 billion since 2009. FTSE 100 Directors had a 21% pay rise last year and now earn 123 times the average Scottish full time worker. In 2000 that ratio was 40 times. Oxfam calculated that the combined wealth of the richest 1 per cent will overtake that of the other 99 per cent of people next year. A staggering statistic on global inequality. Much of this inequality has been driven by tax dodging. Contrast how the rich and big corporations are allowed to dodge tax, to how the same state treats the unemployed. There were 1,046,398 sanctions, or financial penalties, imposed on Jobseeker’s Allowance claimants in 2013. Five years after HMRC got the HSBC data there has been one prosecution. The penalties for tax evasion remain lenient while the sick and disabled are humiliated by work capability assessments and Jobcentre staff are put under pressure to meet sanction targets. Falling petrol prices may deliver a cut in the headline inflation rate, but it only masks the real pressures on family finances. Since 2007 the average rent for a Council House has increased by 26% and in the same time period the wages of a Council Worker has increased by 8.3%. Families have been plugging the gap by using savings or getting into debt. 30% of families say they have less than £500 put away, compared with just 14% in 2013. 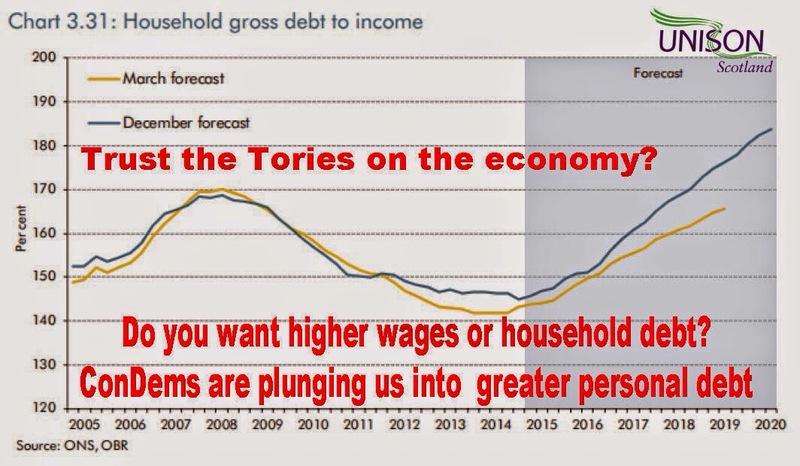 The scariest chart from the OBR report on the Chancellor's Autumn Statement shows just how much Osborne is relying on household debt to dig us out of the economic mess he has created. The last time this happened we ended up with the longest and deepest recession ever. Labour is committed as its 'central task' to build an economy that, "creates the better paid and more secure jobs we need to raise living standards". They understand that economic growth is the best way to pay down the deficit. This doesn't mean a sudden big increase wages, but it does signal an important change in direction. Practical measures like an increase in the minimum wage to £8 an hour, a ban on exploitative zero-hours contracts, promoting the living wage and a new lower 10p starting rate of tax. A national goal to halve the number of people in low pay by 2025 would lift two million workers out of low pay. Labour's plan for work also recognises the role of trade unions in the workplace and in tackling excessive executive pay. 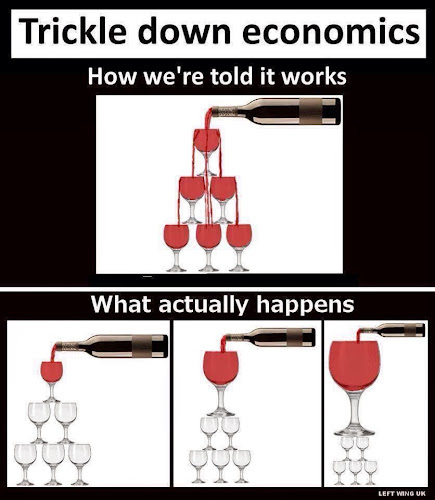 The Tories believe that growth is trickled down from the top and have promoted a system where you compete by cutting wages and conditions for everyone else. A race to the bottom that's a key factor in the UK's poor productivity, lower tax receipts and increases in welfare spending. Of course Labour's plans on wages should be more radical and we should press for more. 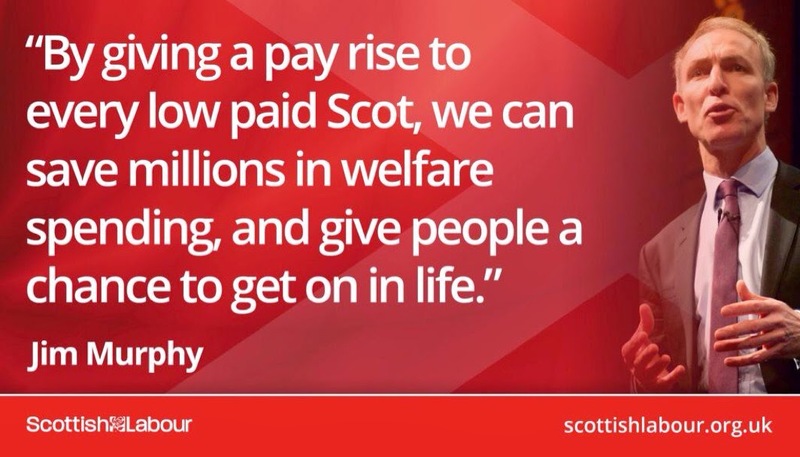 Scottish Labour has established a Commission to report later this year on how we can 'abolish low pay' in Scotland. The choice in this election is between more of the same trickle down economics from the Tories, or a new direction on wages from Labour. So, this election really does matter for wages - please remember that on May 7. ‘They are all the same!’ is perhaps the most common response of the politically uncommitted at election time. I’ve been involved in elections since I was twelve years of age and if I’m honest there were times when that statement might have had an element of truth in it. However, this election isn’t one of them. This election offers a stark choice between two very different governments. So it matters and it matters a lot. Over the next few weeks I am going to set out the reasons why I think it matters and I am going to start with the most important for me – public services. In Scotland, most of our public services are devolved. Every time I visit the Scottish parliament, to give evidence or meet MSPs, I remember what a huge achievement devolution was for the last Labour Government. It enabled a different approach to the delivery of services - most importantly in the NHS thanks to the NHS Reform Act 2004 that swept away marketisation. That doesn’t mean that this election is irrelevant to Scotland’s public services. It matters because the size of the Scottish budget depends on the UK government’s overall spending plans. We know from those published plans that the Tories are planning to cut UK spending by a further £30bn. The Scottish Government reckons that’s about £3bn a year for Scotland. In fairness, I think that is over egging the impact, as not all those cuts will count for Barnett formula consequentials. A more realistic figure is around £2bn a year. However, that is still a huge cut on top of the devastation already wrought on Scotland’s public services in the name of austerity. It will result in around a further 30,000 public sector job cuts, or put another way, it would pay for around 50,000 staff nurses. And before anyone shouts moronic slogans like ‘Red Tories’ – Labour did not vote for the same level of cuts at Westminster. Yes, they will balance the budget as every party is committed to, but no further and in a very different way. In fact, the positive consequentials of Labour’s tax plans will add £800m to Scotland’s budget. It may not be a return to the early 2000’s, but it’s a lot different to the savage ideological cuts the Tories are planning. I am not a tribal political animal who shouts the equivalent ‘Tartan Tories’ jibe at the SNP. I am happy to acknowledge many of the positive polices they continued with after 2007 and they understand the role public services play in civilised society. However, yes you knew there would be a but, there is one policy they are pursuing at this election that would be a disaster for Scotland’s public services – Full Fiscal Autonomy or Devo-Max as it is commonly known. I have set out why elsewhere and will do so in detail in a forthcoming Red Paper publication. The bottom line, even allowing for optimistic assumptions about borrowing at the equivalent UK levels, is a further £3.8 billion cut from public services. This amounts to half the education & training budget and one third of the health budget – or between 50,000 and 60,000 public sector job losses. My worst nightmare is of course another Tory government, but there is second. An incoming Tory government faced with a big number of SNP MPs, saying, OK, if that’s what Scotland voted for, let’s give them Full Fiscal Autonomy. The Treasury would be able to dump £7.5bn of the deficit on the Scottish Government and just walk away. Win-Win for the Tories and applauded by UKIP, who are of course their most likely coalition partners. The good news for those who believe public services are the most important issue in this election, is that Scottish voters agree. UNISON Scotland commissioned an opinion poll in which voters confirmed that public services, welfare, jobs and pay were the most important issues for them in the coming general election. 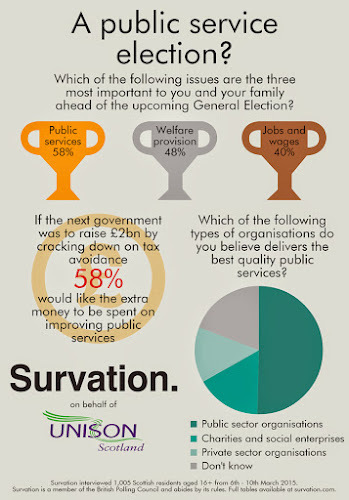 So, this election really does matter for public services, despite devolution. Vital services and thousands of jobs depend on the outcome. Please remember that on May 7. All Health Boards and Local Authorities in Scotland are required to submit their Integration Schemes for Ministerial approval by today. The new Health and Social Care Partnerships across Scotland will be up and running by April 1, 2016. The BBC is running a good feature across the UK today, on how the different administrations are tackling integration. The Scottish Government’s standard response to all questions on bed blocking and social care is that the new joint bodies will sort out all the problems. A response that should send a shudder down the spine of those appointed to lead them! In my BBC interview I welcomed the broad approach, but urged some caution. Simply moving the managerial deck chairs around will not solve some of the big challenges facing the sector. There is strong international evidence of what works in care integration and the common feature is that it's about people. Sadly, in this whole process that's the bit that has been given the least attention. The focus has been on structures and budgets rather than workforce issues. The biggest challenge facing the new organisations is social care. The number of patients in hospital who shouldn’t be, is now the equivalent of the number of beds in Scotland’s newest and biggest hospital - South Glasgow. Setting new targets for delayed discharge is all well and good, but councils need to be funded to deliver the quality and capacity of social care to get these patients into community settings. Local authorities have taken the brunt of austerity cuts in Scotland while the NHS has had a degree of protection. Demand for social care has also been rising and as a consequence most councils have commissioned a race to the bottom in outsourced home and residential care. Wages and conditions have been cut as well as the time allocated to care properly. UNISON’s Time to Care report and the subsequent survey of staff involved in care integration makes this very clear. We have now reached a position where many providers are unable to recruit and retain the quality or quantity of staff needed to deliver even a basic service. To address this we urgently need a new procurement framework that addresses how care services are commissioned including a common workforce framework. The workforce element should include the Scottish Living Wage, ending the reliance on nominal and zero-hour contracts, proper training and most importantly, time to care. All of this requires the Scottish Government to resource the changes needed and for the rest of us to give them some political space by recognising that the NHS is only part of the care system in Scotland. Health and care integration is right in principle, but the practice is more challenging and the first priority is to tackle our crumbling social care services.